Our Monterey Jack cheese is semi-soft with a smooth and creamy texture. Wisconsin is the leader in Monterey Jack cheese production. We also infuse our Monterey Jack cheese with so many tantalizing spices, herbs, vegetables and fruits. Mild in flavor this cheese melts perfectly over burgers, enchiladas and is a perfect addition in quesadillas. Our cheese goes perfectly with Riesling wine and Amber Ales. Our Morel Mushroom and Onion has a nice earthy flavor combined with the buttery, creamy taste of a fine Monterey Jack cheese. This cheese would be an excellent addition on a party tray pairing it with dried fruit, nuts, olives, artisan bread and/or savory crackers. Wine pairings are: Sauvignon Blanc, Chardonnay, Riesling, Merlot, Pinot Noir and Zinfandel. Beer pairings are: Lagers and Pilsners. Our Tomato Basil is a mild tasting, creamy semi-soft cheese that is enhanced with the sweet flavor of basil and dried tomatoes. A perfect addition to any Italian dish, salads or pair it with some vegetables. Another excellent choice is to grate it over some tomato soup or take your grilled cheese sandwich to a whole new level. A glass of Chianti pairs nicely with the Mediterranean flavors of our Tomato Basil Monterey Jack. Our Jalapeno Pepper Monterey Jack Cheese will tantalize your palate. Our semi-soft, creamy and buttery cheese combines with the flavorful spice of the Jalapeno Pepper; creating a bold and rich flavor. Perfect for spicing up your burgers, sandwiches and for melting over nachos or pizza. A nice wine pairing with our Jalapeno Pepper Jack would be a Sauvignon Blanc. A wonderful beer selection would be Pale Ale. 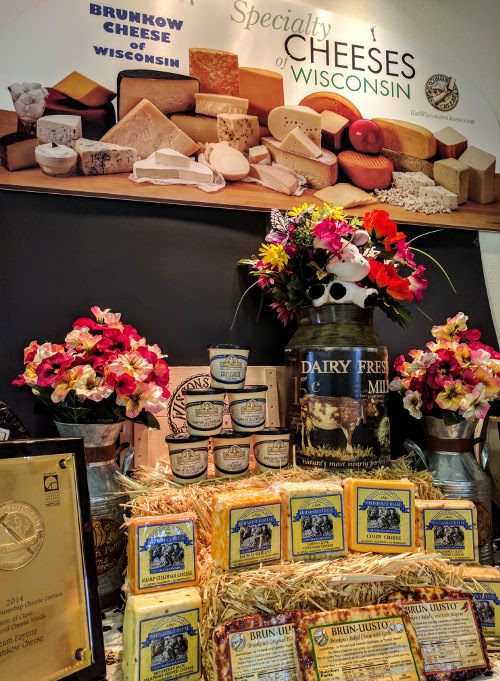 Our Jack-O Cheese (AKA: Jack and Jill or Cojack) is a blending of Colby and Monterey Jack cheeses creating a creamy, mild and mellow flavor with a marble coloring of orange and white. It is commonly found on cheese platters. It melt well making it perfect for grilled cheese sandwiches and casserole dishes. 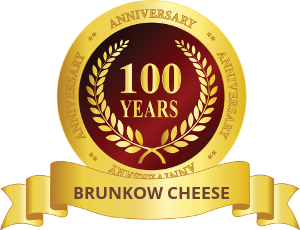 Brunkow Cheese’s Firehouse Monterey Jack Cheese is an awesome blend of Jalapeno and Habanero Peppers combined with the smokiness of Chipotle Peppers that is guaranteed to tantalize every heat seeker’s taste buds. Try it with savory crackers or on artisan bread. Melt it over burgers or give your grilled cheese that extra kick. If you like it hot, then this is the cheese for you. Our Ghost Chili Pepper Jack is twice as hot as the Habanero Pepper blended to perfection with our creamy Monterey Jack cheese. It starts out with a sweet, light peppery flavor that gradually builds to hot. Spice up that burger with a slice of Brunkow’s Ghost Chili Pepper cheese. We guarantee it will give your taste buds a KICK and then some. Yes some like it hot, but some like it even Hot, Hot, Hotter! Our Scorpion Chili Pepper (one of the hottest peppers in the world) is definitely not for the “faint of heart”. A nice blend of our creamy Monterey Jack Cheese and Scorpion Peppers. Add it to your burgers, sandwiches or enjoy a slice of it all on its own, just be sure to keep a glass of milk near by. Warning: You may experience tearing up and/or hiccups.